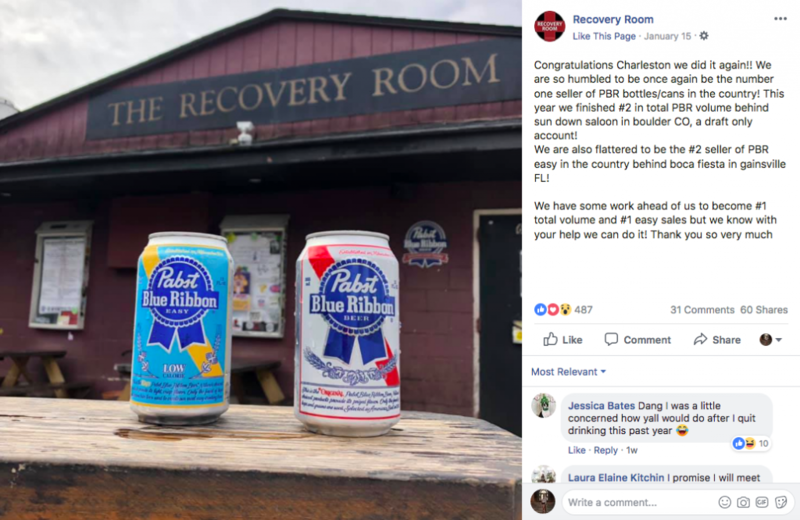 The Recovery Room, a small dive bar on upper King Street, is keeping its crown as the number one seller of Pabst Blue Ribbon bottles and cans in the country for the fifth year in a row. Sharing the news on Facebook, many users congratulated the bar on their continued success. Typically referred to as Rec Room, the bar also earned the number two spot in total PBR volume right behind the draft-only bar, Sun Down Saloon in Boulder, CO; and is the second largest seller of PBR Easy in the country. Rec Room is no stranger to awards though. Back in 2009 they won Best New Bar in Charleston followed by years of being the Best Cheap Bar, Best Late Night Bar, Best Pick Up Joint, and more. Planning a night out on the town anytime soon and want to help them reach number one in volume? They’re open daily from 3 pm – 2 am with the exception of Sundays from noon – 2 am. The kitchen is open every day from 5 pm – 1 am, and they have plenty of activities to keep you busy while you wait for your food. Come for the PBR, stay for the fun. Check out The Recovery Room here.